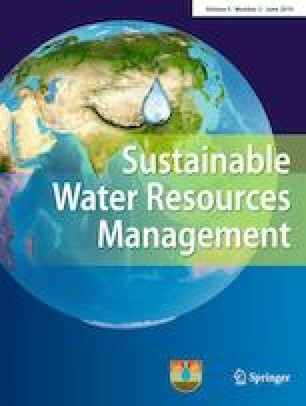 Present study aims to evaluate the potentiality for the application of rainwater harvesting (RWH) technique through dug well recharge (DWR) system in agro-based drought-prone Barind Tract, NW Bangladesh—the granary. Meteorologically, the climatic condition in the area leads to vulnerability of drought where annual average rainfall amount is about 1300 mm (national average of 2550 mm), but, due to the agricultural practices, huge amount of groundwater is withdrawn for irrigation. The aquifer for large-scale groundwater development exists at greater depth at present. Annual average temperature is 25.93 °C with high average humidity value of 75%. Geophysical survey shows that the top most clay layer of thickness (17 m) of low infiltration capacity is a great barrier for natural groundwater recharge and below top most clay layer sandy aquifer layer of 31 m thickness is considered as potential zone for groundwater development. Groundwater-level (GWL) depletion during the period of 1980–2017 is nearly 9.96 m with an average declining rate of 0.378 m/year. The declining rate of GWL has abruptly increased after 2004. The aquifer is not fully recharged even during rainy season, and the GWL does not reach its original position after 2004. Therefore, groundwater resource is under stress and the situation is worsening due to increasing irrigation demand with extension of command areas. Moreover, temporal variability of precipitation along with the declining trend of GWT is the burning governing factor for RWH system as adaptation strategy. In the present study, an RWH system is operated in the Kakonhat Pourashova of Godagari Upazila through construction of DWR structure where rainwater is harvested from the roofs of Pourashova and auditorium buildings with a catchment area of 692 m2. Here, the amount of water consume by each household is 224 liters per day. The groundwater recharge with RWH technique is operated by the Managed Aquifer Recharge (MAR) technology through dug well (1 m diameter with a depth of 23 m), and includes a recharge box (22 m3) structure filled with sands of different texture act as filter. Considering the run-off coefficient of 0.85 and the annual rainfall of 1300 mm, this DWR structure can harvest 765 m3 of rainwater that can be stored in the aquifer for further use. Otherwise, if this amount of rainwater is not harvested in this way, this would be lost as evaporation due to high temperature and low infiltration capacity of soil, or flowing as run-off water into streams and ultimately to rivers. The research findings presented in this paper could be applied in areas with similar socio-economic status and climatic condition as a novel technique for adaptation measure in drought-prone areas in Bangladesh.